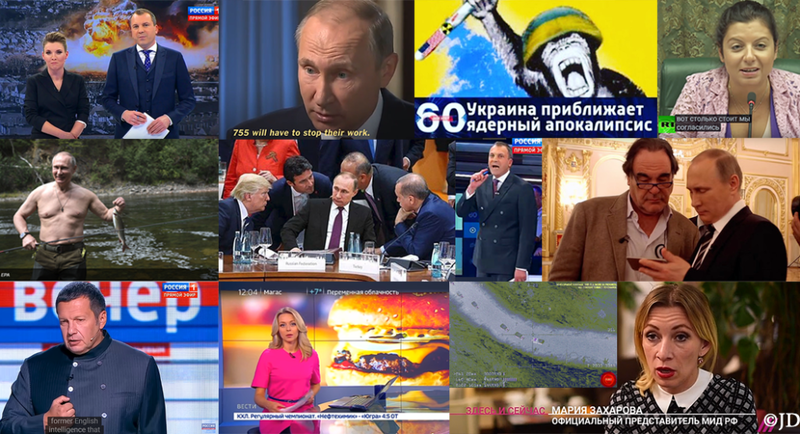 Since the start of the Ukrainian revolution, subversive Russian media has been transformed into an outright propaganda machine. Since that time, the Kremlin’s factory of lies extended its operations, along with Putin’s expanding geopolitical objectives. This installment of Russia’s debunked falsehoods includes examples from different parts of the world. 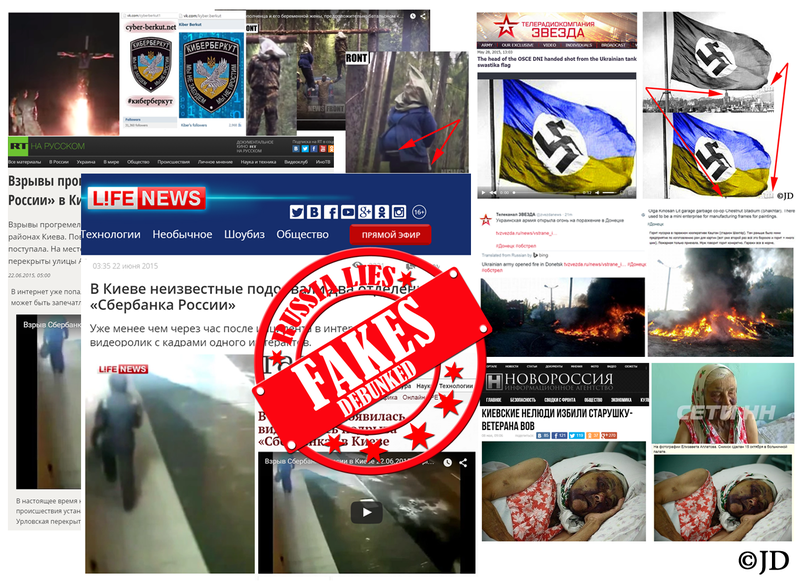 Russia’s propaganda games continue to escalate, parallel to its on-the-ground activities in Ukraine. Amorphous tactics of deliberately faking, distorting or skewing information are designed to make detection more difficult. 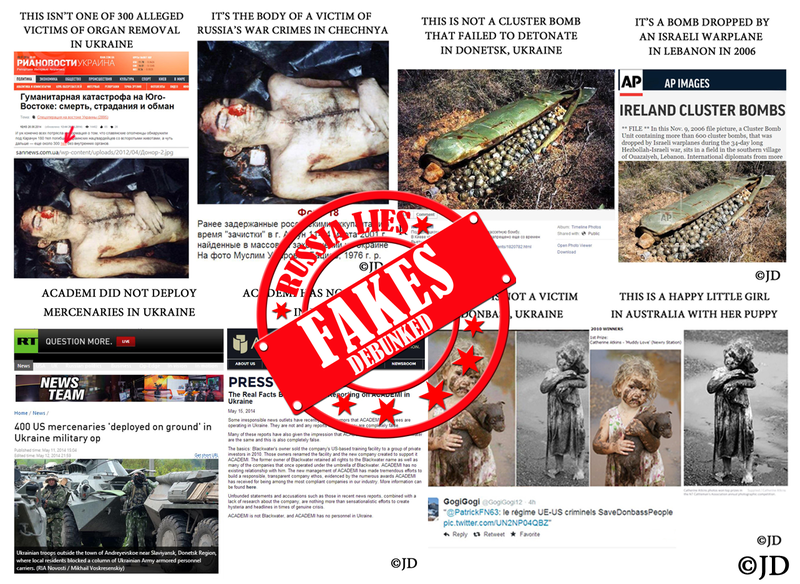 For example, Russian media scaled down their misuse of photographs from Chechnya, Syria and other parts of the world as images of Ukraine, since those fraudulent representations are easily refuted. 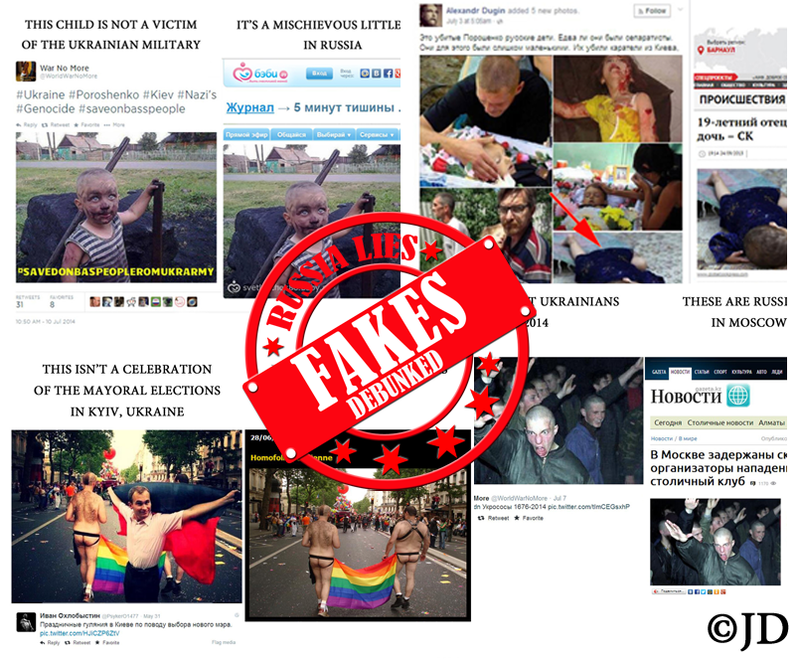 Propagandists resorted to altering images – for example, adding swastikas to Ukrainian flags and so on. Nonetheless, that technique was also easy to debunk. 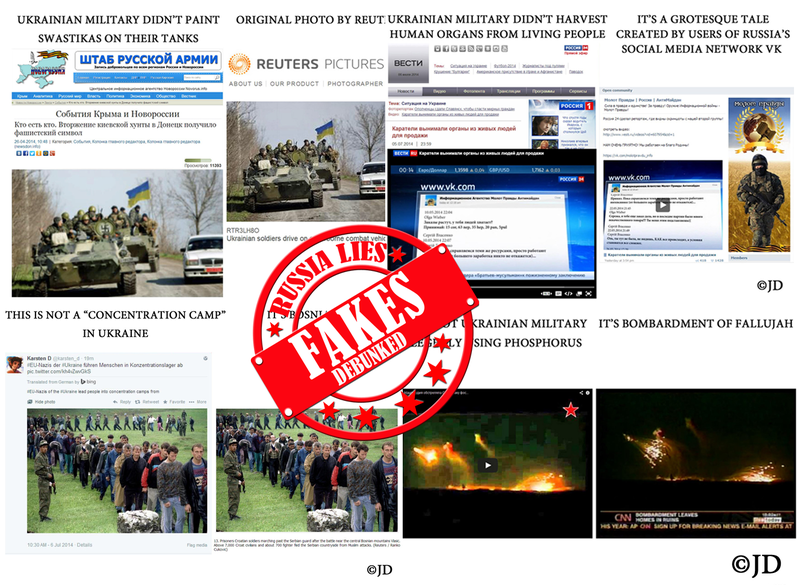 Therefore, the Russian media machine evolved to staging entire “events” and “demonstrations,” in order to produce original imagery and video recordings that would be considerably more difficult to dispel. The Kremlin’s propaganda continues to advance by leaps and bounds. 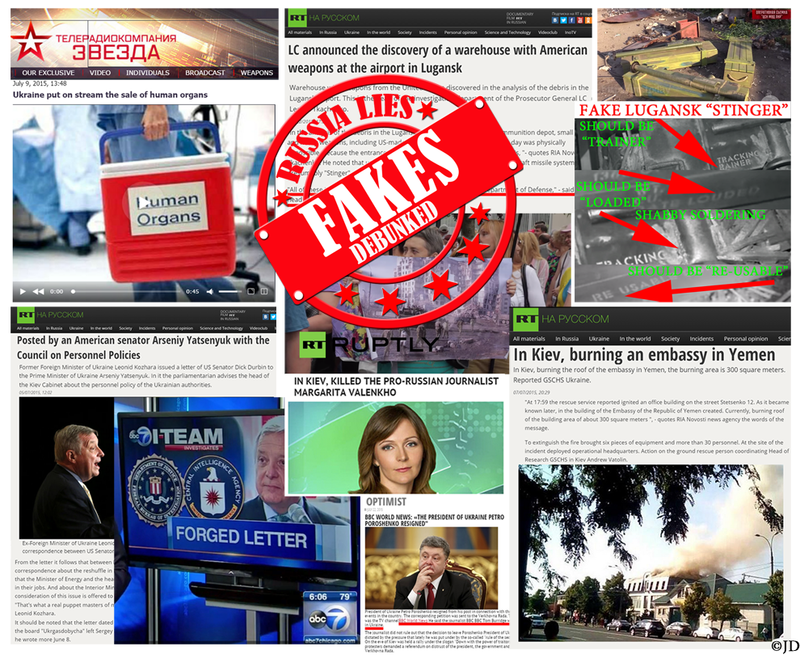 Instead of being embarrassed by the constant stream of debunked news stories, Russia’s agitprop machine is on the offensive. The principle of “mirroring” is a common Soviet/post-Soviet tactic employed by the Russian Federation, brazenly accusing opponents of the same actions Moscow is undertaking. 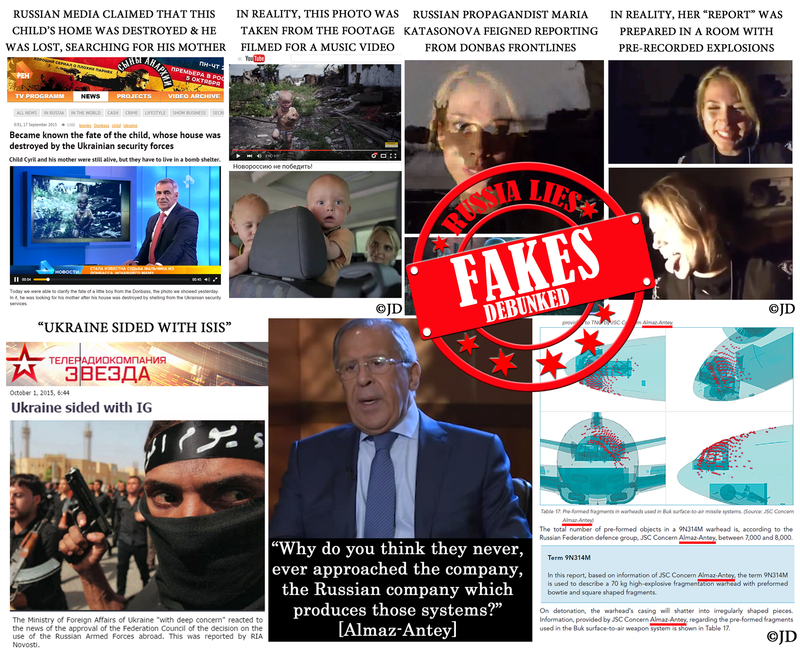 Russia’s talking heads and Internet trolls have taken to accusing the West of inventing “the myth of Russian propaganda.” The Kremlin’s official and unofficial spokespersons disingenuously accuse Ukraine of “faking the news.” The stream of phony “experts” delivers deliberately false narrative to please the likes of RT and Sputnik. 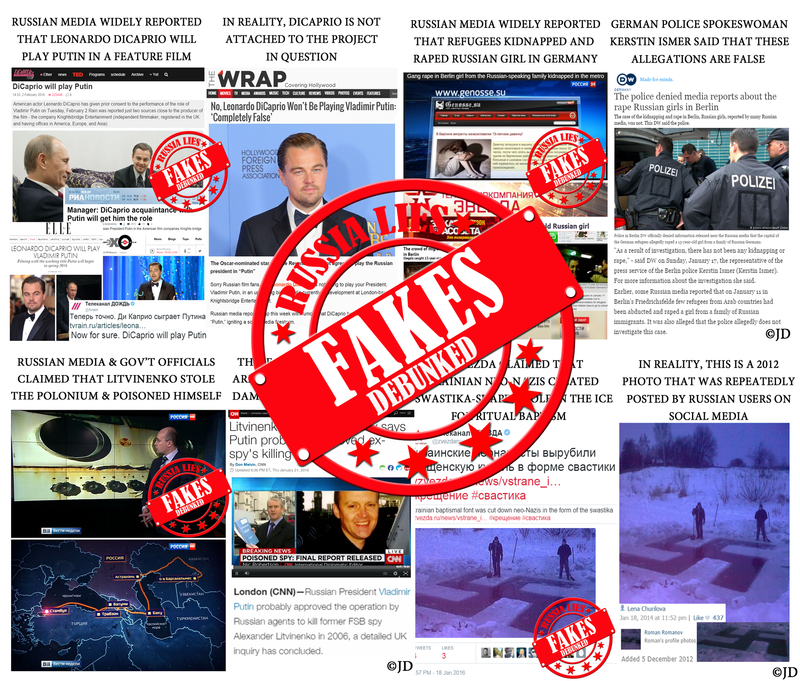 Russian media outlets tirelessly disseminate various hit pieces, targeting reporters and researchers who successfully debunk Kremlin propaganda. They’re aided by hordes of paid trolls. Nonetheless, this elaborate smokescreen is not sufficient to override outrageous misrepresentations and outright fabrications birthed by Russia as a diversion for its covert offensive in Ukraine. 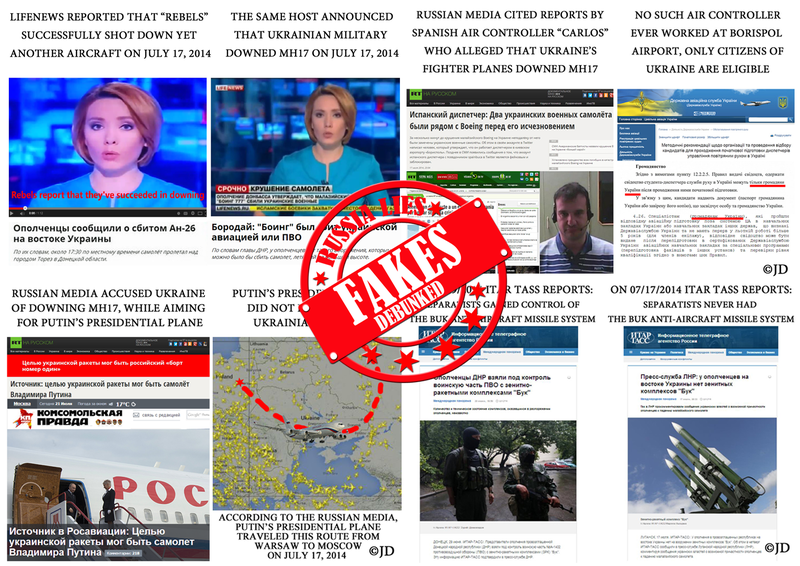 Russia’s onslaught of disinformation against Ukraine continues to pour through the pipelines of the Kremlin’s puppet media. It should be noted that after facing many embarrassing fiascos, Russian propagandists have changed their modus operandi. The use of photos from other conflicts is no longer as prevalent. Instead, photos and videos are now being staged to represent protests and other events in Ukraine. Another tactic involves planting stories in various blogs and media outlets, which Russian media then proceeds to re-appropriate. Russian propaganda also relishes and regurgitates convenient pieces provided by the ill-informed “useful idiots” in the West. The tragic downing of a Malaysian passenger plane sent Putin’s elaborate propaganda machine into overdrive, ultimately causing it to unravel. The evidence points overwhelmingly at the terrorists, whose leaders are Russian citizens, current and former members of the Russian armed forces and FSB. In the past, their presence on the frontlines alongside the terrorists in Ukraine provided valuable advantage to the Russian media outlets. They were typically the first on the scene, filming the footage that would be shown on Russian television in short order. This powerful sword of immediate access to live events finally cut the other way on July 17, 2014. 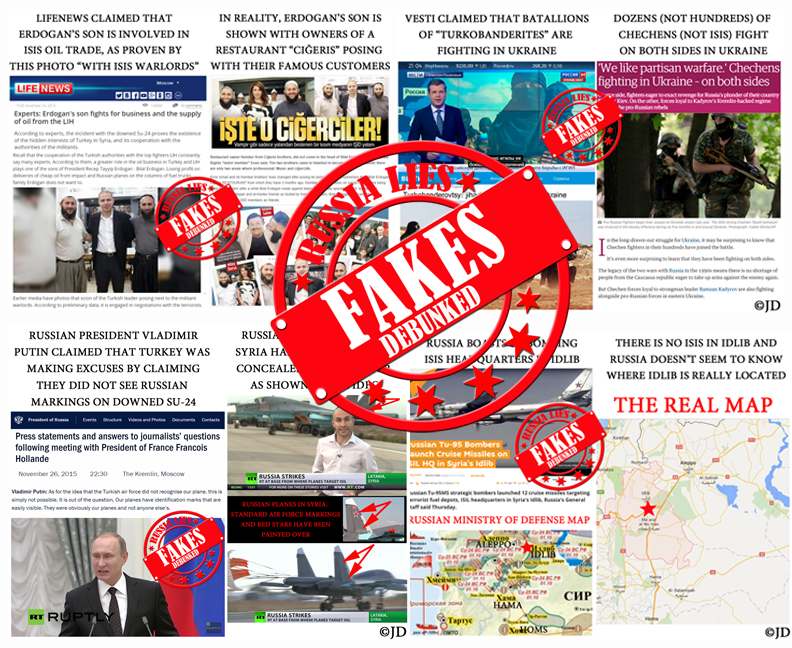 Russian media and the terrorists themselves were caught red-handed in making numerous misrepresentations and outright fabrications, intended to override their own previous admissions. Here is a collection of the most outrageous lies with respect to the shooting down of the Malaysia airliner. 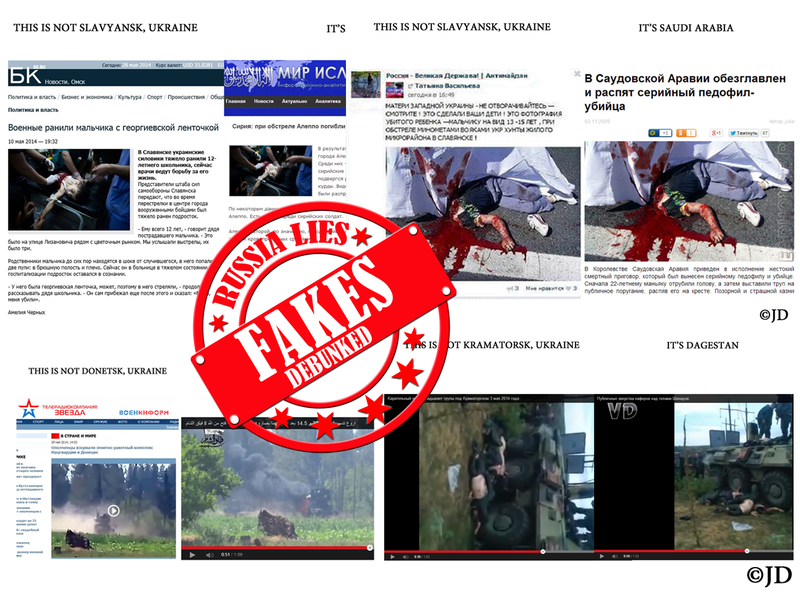 Russia’s aggressive disinformation campaign about recent events in Ukraine reached epic proportions. For example, Alexander Skryabin (who died of cancer in 2011) was revived by the Russian mainstream media to commit not one, but two sets of separate terrorist acts in Ukraine. Even after this fabrication was exposed, only Russia Today removed the article and published a retraction. It should be noted that Russia’s information war is waged not only through its mainstream media. Years ago, Kremlin recognized the power of social media and decided to exploit it. Government-funded campaigns include expatriate Russian bloggers in Germany, India, and Thailand. 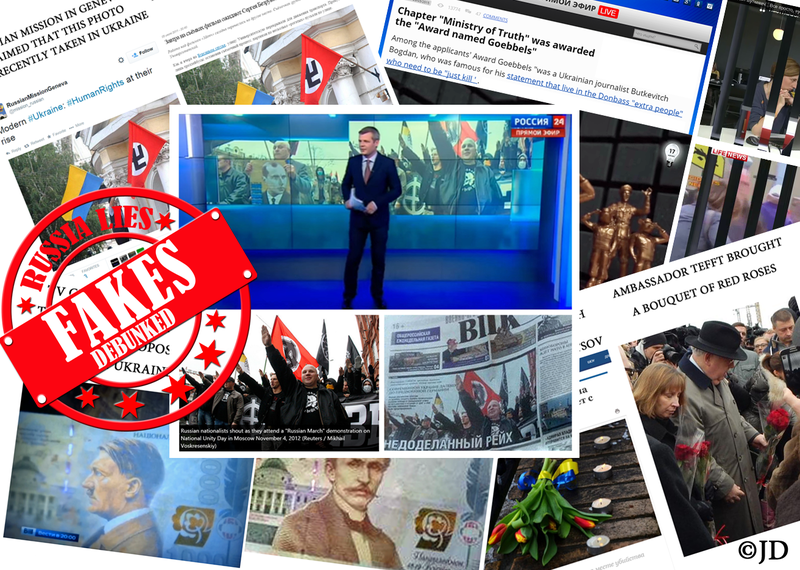 American conservative bloggers were also paid to write pro-Yanukovych stories, denouncing the Ukrainian revolution and spreading falsehoods about “fascists and Nazis” allegedly controlling the new government of Ukraine. Elaborate troll farms employ hundreds of paid trolls, hired to spread deceptive imagery and deliberately false information. They are also tasked with attacking activists, flooding comment sections of news articles to promote Kremlin’s worldview and praise Russia’s political leadership. 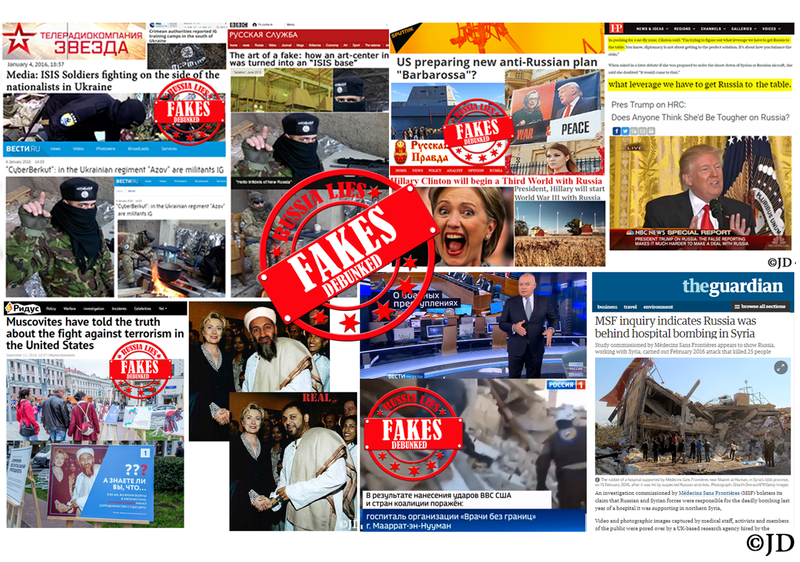 Russia’s mainstream media reporting often uses social media postings as its primary sources. 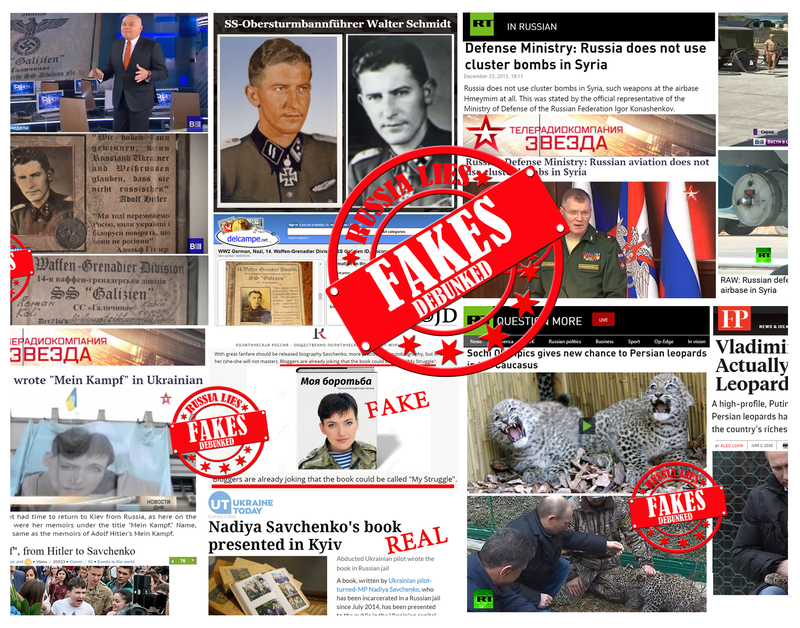 Russia’s aggressive propaganda machine keeps churning out falsehoods, provocations and outright lies about the situation in Ukraine. In spite of being repeatedly exposed, it shows no signs of slowing down. 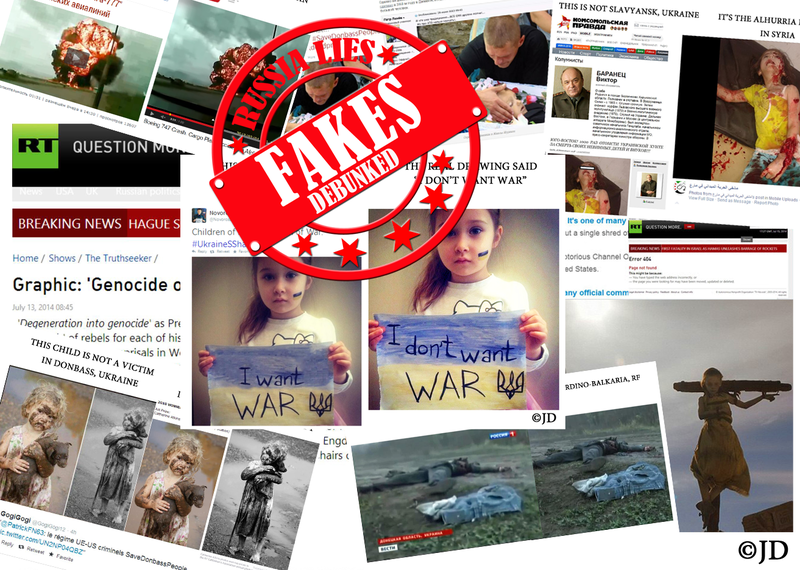 Disinformation is being laid on thick and poured out in a variety of forums: streaming down from the Kremlin, to Russia’s mainstream media, on to bloggers, down to useful idiots and hordes of paid trolls, who plague comment sections of articles about Ukraine and spread vitriol, hatred and blatant lies all over the social media.